The museum's façade, Brunswick Square. A statue of Thomas Coram is to the far right. The Foundling Museum in London tells the story of the Foundling Hospital, Britain's first home for abandoned children. The museum houses the nationally important Foundling Hospital Art Collection as well as the Gerald Coke Handel Collection, the world's greatest privately amassed collection of Handel memorabilia. After a major building refurbishment it reopened to the public in June 2004. The museum examines the work of the Foundling Hospital's founder Coram. In 1926, the hospital’s building in Bloomsbury was sold off, and the children moved to modern premises outside London. The Thomas Coram Foundation (now known as Coram) built a new headquarters in Brunswick Square, where works are displayed in historic interiors preserved from the original orphanage. The museum's building was refurbished in 2004. 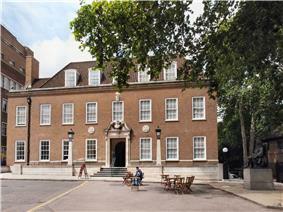 The Foundling Museum was set up as a separate charitable organisation in 1998. Coram owns more than 100 paintings, probably worth more than £30 million. To safeguard the collection, a deal was agreed in 2002 under which Coram lent the pictures to the museum, allowing it to raise money to buy them over a 25-year period. In 2013, however, attorney general Dominic Grieve wrote to Coram stating that he is concerned that its "treatment of the museum … does not appear to fit with the spirit and intent of the arrangements put before the attorney general [in 2001]". In 2012, it had 48,000 visitors. The Foundling Hospital Collection includes works of art by Britain's most prominent eighteenth-century artists: William Hogarth, Thomas Gainsborough, Joshua Reynolds, Louis-Francois Roubiliac and many others. These paintings and sculptures, often donated by the artists themselves, were given in order to support this Britain's first home for abandoned children. These works effectively made the Foundling Hospital the nation's first art gallery available to the public. The museum also lets the visitor see furniture, photographs and other items from the days when the Foundling Hospital still accepted abandoned children to be reared and educated within its walls. Foundling tokens (coins, a button, jewelry, a poem) were given by mothers leaving their babies, allowing the Foundling Hospital to match a mother with her child should she ever come back to claim it. Sadly, the overwhelming majority of the children never saw their mothers again and their tokens are still in the care of the museum. 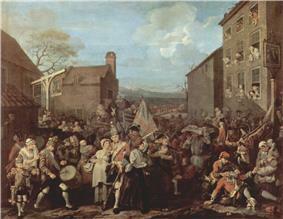 March of the Guards to Finchley (1750), William Hogarth's satirical masterpiece, donated by the artist to the Foundling Hospital. The Committee Room, one of the original eighteenth-century interiors, is the room where mothers intending to leave their babies would be interviewed for suitability. It now houses several pictures and furniture, including Hogarth’s satirical and political March of the Guards to Finchley and a series of paintings by Emma King, depicting scenes from the lives of the children in the Foundling Hospital. The Picture Gallery is another original interior room. On the walls are paintings of governors and hospital officials through the ages. These portraits include Allan Ramsay’s portrait of Dr Richard Mead, Reynolds’s portrait of the Earl of Dartmouth, and Thomas Hudson’s portrait of the hospital’s architect, Theodore Jacobsen. The Court Room is where the Foundling Hospital’s Court of Governors used to meet. The room is a rococo ensemble of paintings, furniture and interior architecture, designed to make the best possible impression on all future potential governors and donors. The ceiling is a plaster work by William Wilton and paintings include Hogarth’s Moses before Pharao’s Daughter and Gainsborough’s picture of London’s Charter House. The uppermost floor of the Foundling Museum houses the Gerald Coke Handel Collection. An exhibition room presents Handel’s life and visitors can learn about his connection to the Foundling Hospital and see the testament he left behind. A fair copy of the Messiah, left to the Hospital at his death, is also displayed. Four armchairs with built-in speakers play Handel’s music. The building in which the Museum resides, located at Brunswick Square, was built in 1935–1937 and incorporates architectural features as well as original Rococo interiors from the first Foundling Hospital, built in 1741, but demolished in 1926. The current building served as the London headquarters after the child care operation was moved out to the countryside. The refurbishment of 2003–2004 was designed by the London architectural firm 18th century, the 1930s, and today. ^ a b c Martin Bailey (30 September 2013), Art collection at stake in row between museum and charity The Art Newspaper. ^ Charlotte Higgins (23 June 2013), Row over sacking of Foundling Museum trustees The Guardian.